Millions of farmers in the world each year face loss of their crop. Its mainly due to crop disease or environmental problems like nature of soil (pH), poor quality of air, and excessive or very low moisture in soil. To get cure from these problems, farmers need to know the fertilizer according to the condition of the soil and also the amount of water needed everyday for his crop with respect to the temperature, moisture and humidity. More than a million people's occupation in the US is farming and we need a innovative solution, which is affordable and can be implemented in the current scenario. What will be end final product? 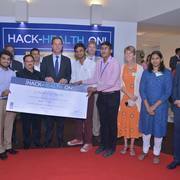 The idea is to make a hardware + mobile app which could be used by farmers, can update farmers with any issues with their farms and can analyse amount of sunlight, rain, soil moisture, pH and can suggest best fertilizers according to the data from the sensors and USDA datasets. It can also compare the data with the local weather data for that GPS location. 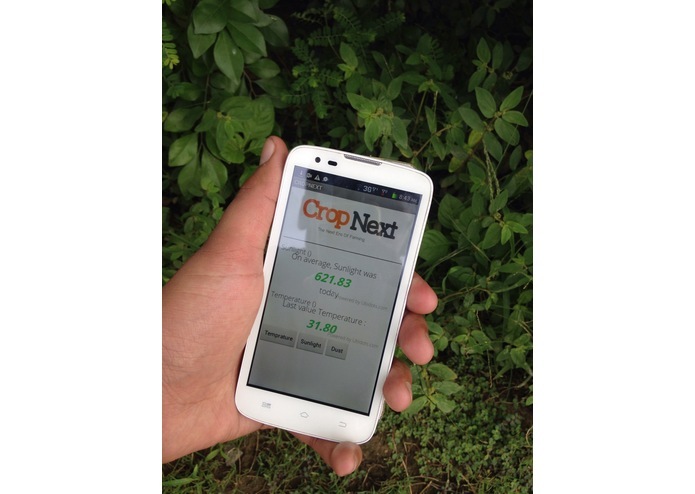 The app will also have real-time updated selling prices of crops for the farmer. The CropNext Farm Sensor tracks light, humidity, temperature, soil pH and moisture, and then cross-references this information with plant, soil science, and weather databases to recommend which plants will thrive. This is the device with the mobile app. First of all, I thought what are the challenges faced by farmers in the US and the world. Then I searched what all is exactly needed by plants. I found the criteria and then started the journey to build the device. I look to many kinds of hardware and found one ans then I build the project on Linkit One development board.All the data is stored in Windows Azure cloud and Ubidots API. 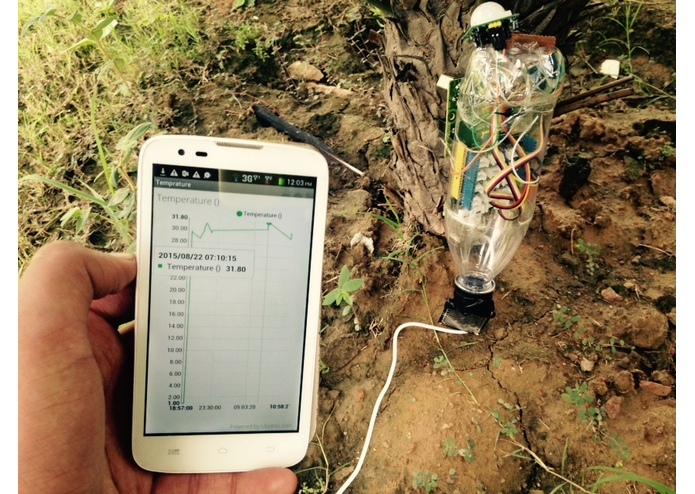 The device records data using local sensors and then pushes that data into the cloud. 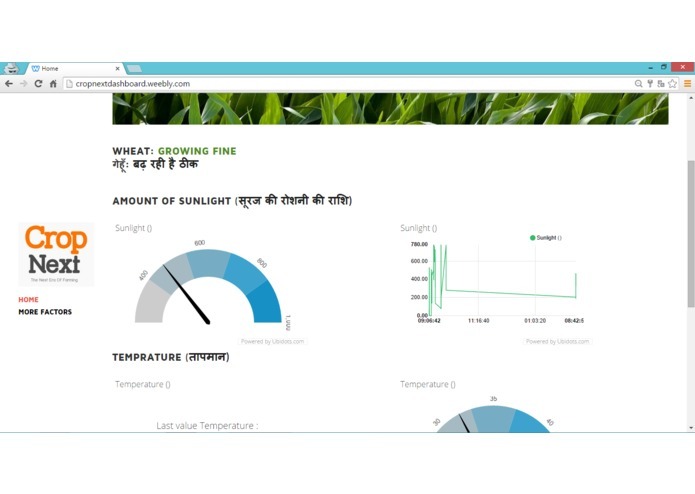 Then the data is compared with the USDA datasets and if the server identifies any issue like low soil moisture, low sunlight, low fertilizer etc, it informs the farmer and suggests him some fertilizers. Also the data can be viewed using a web dashboard and a mobile application. Here you can see how this system actually works. All the data is sent to cloud, then compared with USDA datasets and then notify farmers with any issues. This is the web platform of the device. This will show all real time data. There were a lot of challenges! First of all, with the hardware. I needed to figure out many things, then I worked on the first prototype. Next step was to improve the accuracy, then I worked on that part. Next I worked on lowering the cost of the device, for this challenge, I talked to some mentors and chose the right hardware for my prototype. This was the hardware! 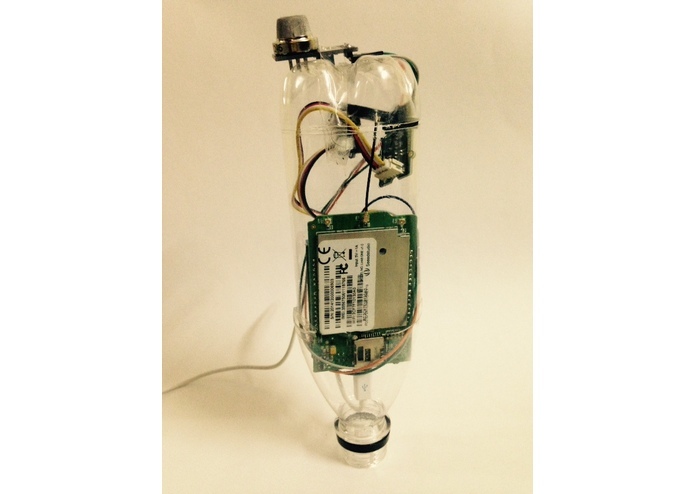 I fixed the hardware into a soda bottle. This was realy easy by cutting it down and pushing the PCB board into it. 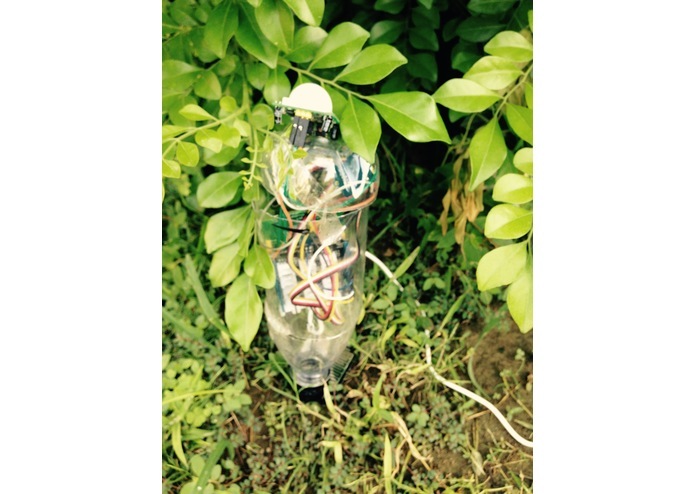 The bottle shape of the device was liked by the mentors. Finally I consulted some mentors for the project and I was very lucky to test the device at Tech Mahindra campus. What change will CropNext make? Let's see current solutions. These are the current solution available. These are big electrodes, heavy machines etc and the main problem is that they can only be used by technical experts and not farmers! The projects aim is to make this system automatic. This is the comparison of my solution to current solutions. I'm proud to make something that can bring a change to the world. I'm proud to make something that helps the middle class farmers to grow more and produce food for us. Make the device more water resistant -making the device more user-friendly Also talking to local companies and NGOs to implement this project. ## What I learned I learnt a lot in this project. I learnt the difference between a prototype and a product. I learnt what is actually in need by the real agriculture workers. All the the end I learnt was that how to make a end product for user.